It's darkly ironic that the part of Liberace's life that he desperately tried to keep secret has come to define him. His career has been all but obliterated from popular culture, we're never likely to ever see a Best of Liberace album top the charts. This is despite his enormous fame - for two decades he was the highest-paid entertainer in the world. Yet as I sat down to watch Behind the Candelabra the only things I knew about Liberace were that he played the piano, that he dressed extravagantly on stage and that he was astonishingly, obviously, colossally gay and his fans were just too plain dumb to realise. Perhaps his omission from popular music history is the reaction to his forcible ejection from the closet upon his death from AIDS in 1987. His die-hard fans were understandably a bit cheesed at being fed a series of lies about his personal life for the last 20 years and there was enough latent homophobia running through society's veins that it's easy to dismiss this extravagantly glittery, megacamp queen as an embarrassing reminder of the worst of 70s excess, something to be swept under the rug. It's into this abyss that Soderbergh's excellent biopic strides. 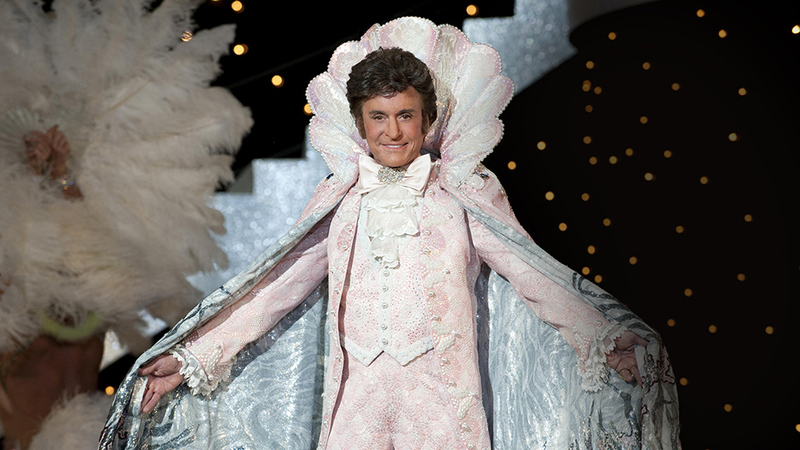 In the 26 years since Liberace's death, opinions of gayness have undergone a tectonic shift. Despite this though, Soderbergh still found it difficult to secure funding for the film, with the Hollywood studios turning it down as "too gay". Eventually he secured funding from HBO Films and assembled an amazing cast. 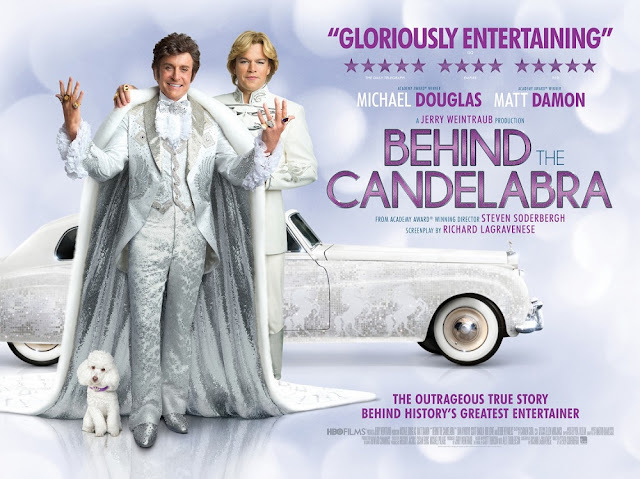 First and foremost is Michael Douglas as Liberace. He's not the first person you'd think of to play the role, but from moment one he utterly vanishes into a mound of white fur, gold and rhinestones and emerges as a complete, rounded and totally believable Liberace. He fearlessly embodies both the stage presence and the private life of the character, and though I don't have any familiarity with the actual Liberace, a clear note of truth rings true in every moment he's on screen. So, despite the initial shock of seeing Douglas in the wig and costumes camping it up you quickly accept him without question. We find Douglas' Liberace in the latter half of his career, an established megastar playing packed out crowds in Las Vegas. Our entry into his world is the appropriate named Scott Thorson (Matt Damon), who looks blonde and well built enough to actually be Thor's son. We meet him as an ambitious young dog trainer and prospective vet living with his foster parents. He appears just about comfortable with his sexuality, his foster parents obviously knowing about his boyfriends and gently disapproving, but accepting him enough to keep their objections to themselves. These two central figures are ably backed up by support in the form of Scott Bakula, Rob Lowe and Dan Ackroyd, three actors it's always pleasant to see in a film. We follow Thorson to a Liberace concert. After he's introduced to the man himself backstage the two quickly fall in lust, and eventually love. Thorson is blonde, built like Charles Atlas and attractively naive and awkward. These factors push Liberace's buttons and soon the two are in a relationship, Thorson employed as Liberace's "secretary". But Liberace's world gets under your skin. Slowly Thorson begins to change mentally and physically, everything about him becoming Liberace-ised, a process which, frankly, doesn't look particularly pleasant. This division between 'normal' life and Liberace's existence is very clearly delineated. Early in the film Soderbergh effectively cuts between Liberace's plush mansion and the dusty, down to earth homeliness of Scott Thorson's average Joe lifestyle. As the years pass, Thorson becomes mutated by close contact to such a strong personality and 'normal' stretches gradually towards the extreme. Eventually things reach paranoiac heights of coke n' booze that the elastic snaps, and Thorson is hurled back to normality with a bump. Liberace is the sun at the centre of the universe here, bright and shiny in the sky, his gravity influencing the path of everyone around him and his light illuminating their lives. But, much like the sun he's unchanging. 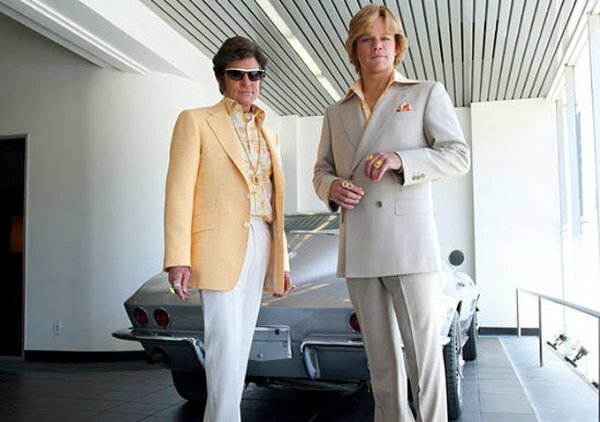 From the moment we first meet Liberace until almost his last scene he's largely the same in both looks and behaviour, successfully battling off the aging process with plastic surgery and wigs and as Thorson ages, able to shift his affections onto a fresh faced young blonde boy at the drop of a hat. Central to the film is Thorson's transformation into something more possession than person. Soderbergh's Liberace is obsessed with the idea of his personal brand; walking around with 'L' rings on his hands, embossing his initial upon everything he comes into contact with. His house is littered with the emblems, portraits of him adorn the walls and there are tiny pianos everywhere. He begins to work this process upon Thorson, first dressing him in new clothes and jewellry and then going to work on his face and body with the aid of Rob Lowe's demonic plastic surgeon Dr. Jack Startz. This metamorphosis into a human Ken doll reminded me of The Rocky Horror Picture Show, with Liberace as Frank N Furter and Scott as Rocky Horror himself. In unflinchingly gory surgical scenes we watch doctors slicing up our two leads, transforming them into simulcra of each other. Thorson's new face is intended to be a reflection of Liberace himself, but rather than looking much like him, he ends up looking a California-odd mimbo meathead. While the love between the two is apparently genuine, so is the love between Liberace and his pet poodles, and slowly we realise that Thorson is becoming less a romantic partner and more another glittery ornament in Liberace's life. This infection by the Liberace meme complex literally works its way under Scott's skin and into his head, by way of addictive diet drugs. It eats away at his sense of self-identity, morphing from a shy vet into an ego-maniacal Frankenstein's monster. In one of the most memorable scenes, he has a coke fuelled breakdown, shouting in terror about how he's "lost his face, forever!". Though this rhinestone studded infection nearly consumes him, he manages to avoid another, more literal infection entirely. Late in the film he meets the dying Liberace, ghost-like, emaciated, bald and grey. This is the real-world colliding with the carefully constructed Liberace fiction-bubble. Liberace, unlike Thorson, is unable to handle the intrusion of the real, his earlier comparison of himself to The Portrait of Dorian Grey seems totally apt. Soderbergh has claimed that this will be his last film before moving into the world of writing and theatre. If it is, it's a damn note to go out on, stylishly and intelligently constructed with an outstanding cast. 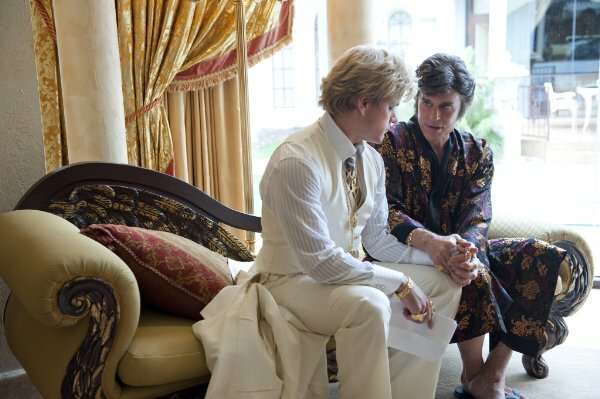 Behind the Candelabra is a brave film too for both director and performers, bringing us right into Liberace's bed and not blinking from showing genuine, heartfelt affection between Douglas' Liberace and Damon's Thorson and the consequences of becoming a part of someone's life whose personal gravity and ego conquers all before it. Behind the Candelabra is in theatres from June 7th.